Bring milk, water and salt to the boil in a heavy based pot. Add celeriac and cook for 20 minutes until soft. Drain and blend in a food processor. Set aside. In a heavy based pan on high heat, seal and season the venison loins in 10ml of olive oil until well coloured, approximately 4-5 minutes. Remove from pan and rest in a warm place. In a small pot, add 100ml water, 20g butter and bring to simmer. Add broad beans and then remove after 1 minute. In a heavy based pan, sauté the pears in 10ml of olive oil until well coloured, remove and set aside. Reheat celeriac puree adding 60g butter and 80ml cream. Season to taste. 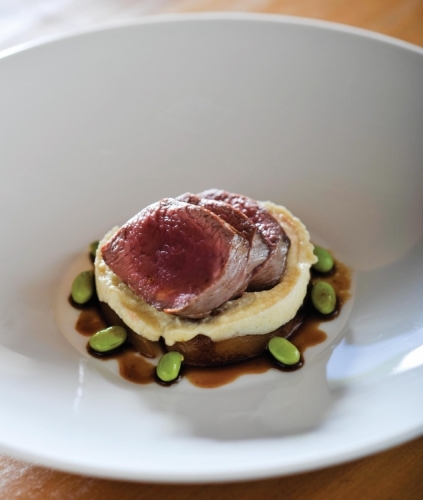 Reheat venison jus and infuse with 4g of Valley of Kings Ceylon Pekoe for 3 minutes. Strain and keep hot.